Yesterday, a long-time dream came true and I crossed the one “must do” in DC off my list. It wasn’t a monument or a landmark or a general sight to see. It was the Newseum. Yes, the museum of news. If you know anything about me, you know I’m a bit off a journalism nerd. I’ve been involved in papers since high school, and though I’m no longer a journalism major (or even a communications major), I do still write for Marquette’s paper (yay Trib!) and in general love newspapers and current events. My favorite iPhone app is not some goofy game or something that can tell me where I parked my car (though that is still useful!) – it’s the New York Times app. So, suffice to say, I am all over this museum. And oh, it did not disappoint. Quite frankly, at times it felt like I would have designed the exact same museum for some of the exhibits it had. For example, I really love old newspapers (old meaning from 1700s to just a couple years ago) – I love seeing what people thought and felt about various issues given their historical context and the information they had available. One part of the museum had probably a hundred newspapers on display from various historical events, from the Revolutionary War to Obama’s election. I probably could have spent all day there. 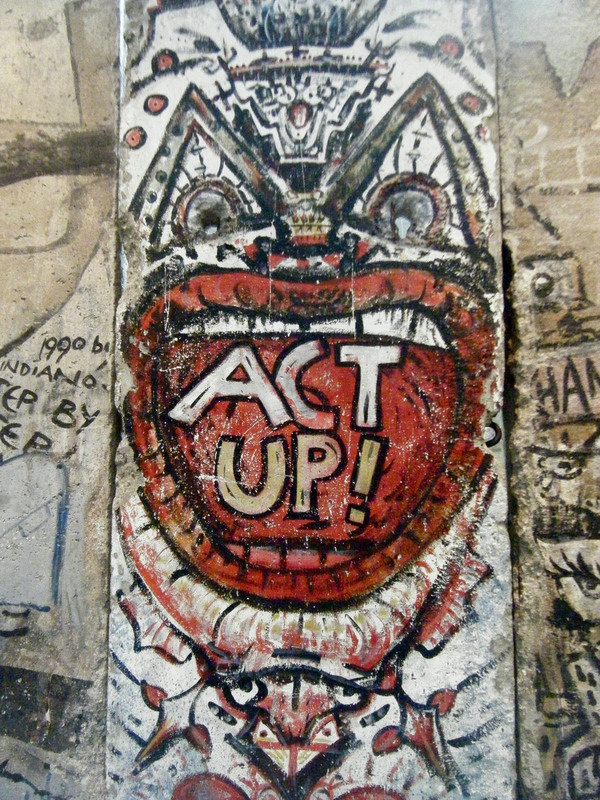 Other notable exhibits: On the basement level, they had a display on East Germany and the fall of the Berlin Wall that included several panels from the wall and an original East German guard tower. On the main level, there was an extensive gallery of Pulitzer-prize winning photographs, including explanations of the events surrounding the photos. It’s always amazed me how a single moment caught on film can have incredible ramifications. 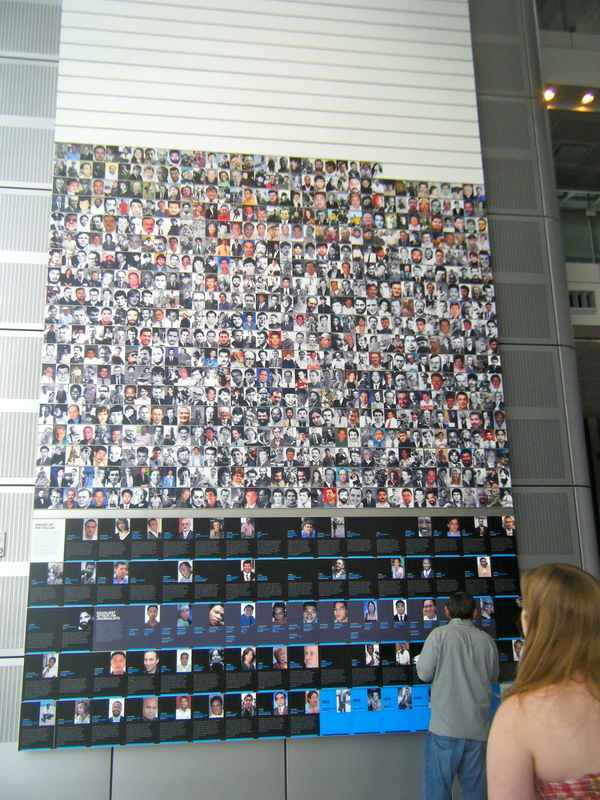 There was a special exhibit on 9/11, focusing on journalistic coverage of the event. This included a massive wall display of front pages from that day – it’s always interesting to see how papers reacted to such a stunning event, with headlines ranging from a bold, jarring “ATTACKED” (which I still remember my hometown paper at the time, The Florida Times Union, using) to the more inflamed “BASTARDS!” It was a little surreal seeing children go through this exhibit, knowing that they really had no idea what it was like to know both the pre- and post-9/11 world. At one point, I was near a woman who was explaining to two girls, who looked to be about 12 years old, what exactly happened on that day. It was hard for me to imagine my only knowledge of 9/11 coming from museum exhibits and stories from others. One of the most stirring parts of the museum was the Journalists’ Memorial and accompanying exhibit on the risks of being a journalist. It seems to me people are so quick to demonize journalists but far slower to acknowledge how tirelessly and selflessly many of them work to cover stories they believe are vital for the world to hear. Every day, journalists all over the world are harassed, kidnapped, tortured and even killed for their work – people like Daniel Pearl or Anna Politkovskaya. Journalists deserve to be revered far more than they deserve to be maligned, in my opinion. The Newseum probably isn’t for everyone. I spent nearly six hours there, so obviously I loved it. If you don’t have a general interest in the media or current events, though, you’ll probably just feel overwhelmed and have a hard time knowing what you should be getting out of this museum. Paying for a museum is a big decision in a city where so many great ones are free, but at least for me, this was easily the best 20 dollars I’ve spent in DC . Ok, you’re right. This is freakin’ awesome. We’re going here. Whoa. How am I not mentioned here? Is not that me in your photo? I thought going there together was one of the best parts. I see how it is.